I believe that artificial intelligence (AI) is a truly impactful technology. The raw computing power available in 2018 allows organizations to unlock the insight from the big data they hold and deliver a better experience to their customer than they ever thought imaginable. 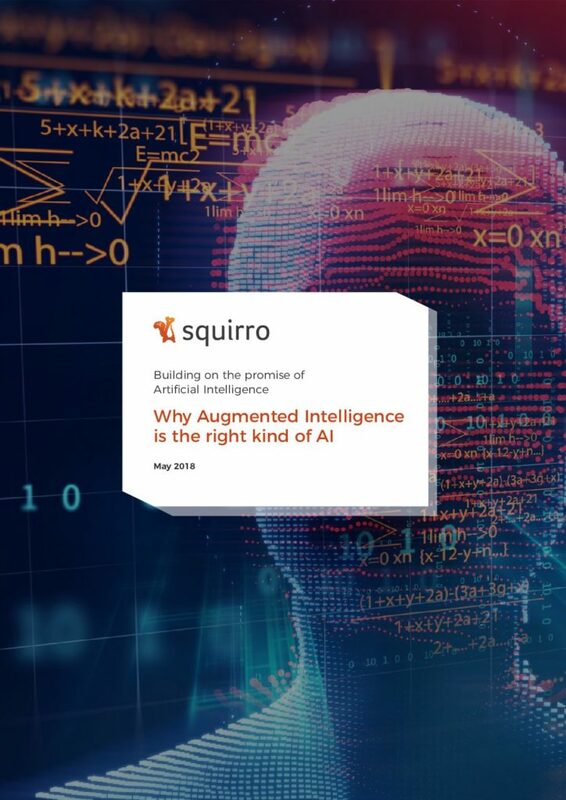 Yet as AI stands on the threshold of true mainstream appeal – Squirro recently launched research that revealed 83% of top tier banks have evaluated AI and more than two-thirds are already using it – it is already time for it to step aside. Augmented intelligence is a more powerful and effective use of computing power than artificial intelligence and fits more with the spirit of the times. This is why. If you asked 100 different people what artificial intelligence means you would most likely get a massive range of responses, ranging from driverless cars to tea-making robots, and from chatbots to humans being replaced by machines. AI is involved in all of the above and is mostly a cause for good. But it’s also true that is has something of a PR problem. There have been too many conversations about machine intelligence supplanting human intelligence, with the repercussions of that ranging from humans losing their jobs to machines to computers ultimately taking over the world! Much of that is sci-fi fantasy of course, but equally it is hard to shake the association that there are elements of AI that are not entirely positive. That’s a shame because some of the advances brought about by AI have been astonishing: computers beating the world’s greatest chess players; automation of factory floors; Ecommerce sites understanding precisely what a customer’s interests and likely next purchases will be, and much more besides. The combination of ever cheaper computing power and massive advances in algorithmic computing allows for even more powerful algorithmic models to become computational reality. Computers can undoubtedly detect patterns in vast amounts of data and derive meanings that have yet to cross the horizon of experience. Yet artificial intelligence can fall short in situations where goals and inputs are more complex. 360-degree view – augmented intelligence-based platforms are powerful at gathering data (both structured and unstructured) from across disparate and siloed systems and presenting that data in a form that gives users a complete 360-degree view of each and every customer. This includes contextual information and trends that allows the user to make smarter decisions based on that data and cognitive and contextual search across all data, so users can find what they are looking for (and be advized on what best suits their needs) much quicker. Data insights – the insight that is delivered by augmented intelligence platforms is where it can really deliver for any organization. Because it is capable of managing and analysing so much data, the insight extracted from that data and then presented to the user is deeper and greater than anything previously possible. Lead generation – one way in which the data insight generated by augmented intelligence can help an organization is in lead generation, identifying opportunities for clients and recommending the best product or solution for them. Augmented intelligence will look at data on competitors, partners and markets and identify catalysts that provide additional upsell or cross-sell opportunities to existing clients, and fresh approaches to prospective clients. Ticket resolution – augmented intelligence can also have a powerful impact on an organization’s IT Service Management landscape. There are a bewildering volume of tickets in most enterprises, but the right platform will provide accurate resolution recommendations, with automated ticket routing meaning better allocation of services resourcing and facilitating self-service when appropriate. Next best action – not only will augmented intelligence identify catalysts and triggers that could prompt contact with a customer or prospect, it will also factor in the context of each opportunity to recommend which is the best course of action to take. In fact, it will score and rank every opportunity and provide actionable recommendations to account handlers. The fact that augmented intelligence can have such a profound and tangible impact on an organization, in such a variety of ways, means that it will be a technology that is truly embraced by business. We all want smarter customers because we want to engage with them in a more valuable way. Augmented intelligence will help revolutionize the way organizations interact with customers. The pairing of humans and machines enable industries to apply AI to business process intelligence, allowing more powerful, effective and value applications of the technology.